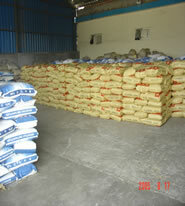 Choline chloride corn cob based and silica based are normally packed in 25 kgs PEPA bags , 25 kgs multi-wall kraft paper bags with 2 PE liners, or in 600 kgs jumbo bags. Considering choline chloride's hygroscopic property, the bags are well sealed. And considering the long way transportation, the outer bag is incorporated with a plastic woven bag for being strong enough. Choline chloride liquid is usually packed in 230 kg plastic drums, which pass a testing of China inspection department and are tough, tensile, well sealed and suit for sea transport. For meeting special customer's requests, goods is also packed and transported in IBC drums and ISO tanks. Printing text or label on the package is neutral or under our name unless the customer has a special request. the flexibility to design and print the package or label them to meet your requirements. We have a good cooperation relationship with the leading shipping lines, such as COSCO, CHINA SHIPPING, WAN HAI and APL etc. They always offer us a low sea freight rate so that we send a better CFR and CIF price to our customers. Their super service make us deliver the goods to customers in time.